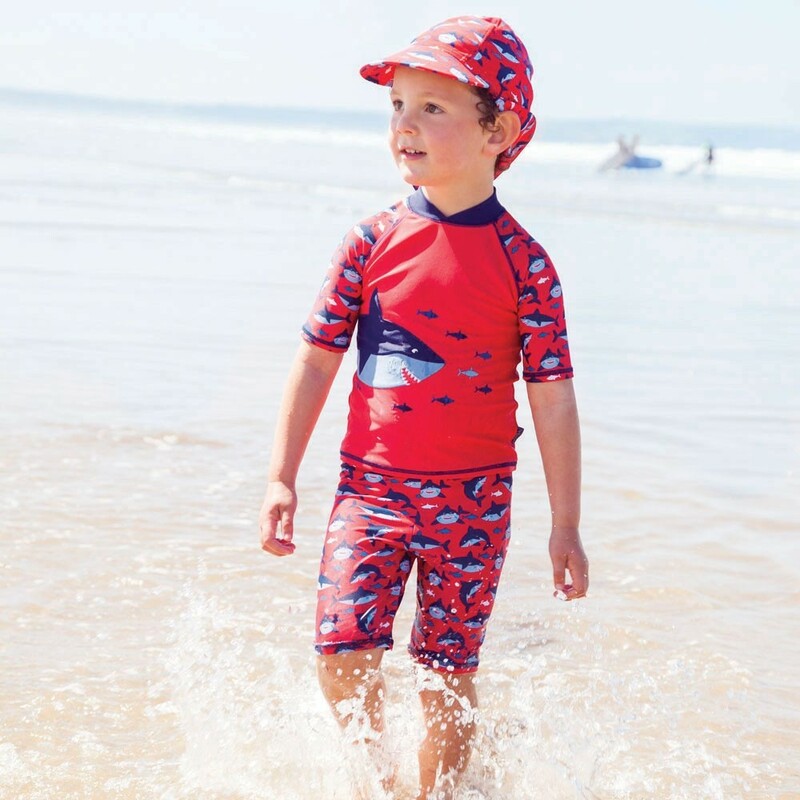 This 2-piece suit is a cute and effective way to protect your child from harmful UV rays. It keeps all the essential areas covered from sunburn, especially the back and shoulders, so he can enjoy the beach longer. Lightweight and quick drying, this suit won’t stick or irritate as he goes from the water to the sand. Keep her little face sunburn-free with this floral sun protection hat. Designed with UPF 50+ fabric, it even features a long flap at the back to keep her neck protected. The snug elasticated fit means it stays put all day, even if the beach gets breezy. Your mini-me is sure to love their very own beach chair to match yours. Available in pink, purple, and blue, your child’s name or initials are monogrammed right onto the chair and accompanying umbrella. This chair is sure to see many days at the beach this summer. For the man who wants to show some patriotism in his outfit this 4th of July, but still stay stylish, we’ve found a few simple fashion upgrades. Whether he’s manning the grill or tossing horseshoes with buddies, these Commando sunglasses are up for anything this 4th of July. The polarized lenses are made with triacetate cellulose to provide clarity and 100% UV protection, so no matter how sunny the day is, these shades keep him looking cool. Stripes on the 4th are a given, so why not mix things up with this dip-dye tank? This tank features a soft cotton jersey blend for a relaxed fit that keep him looking and feeling chill and laidback. Pair with medium wash denim for classic American style. 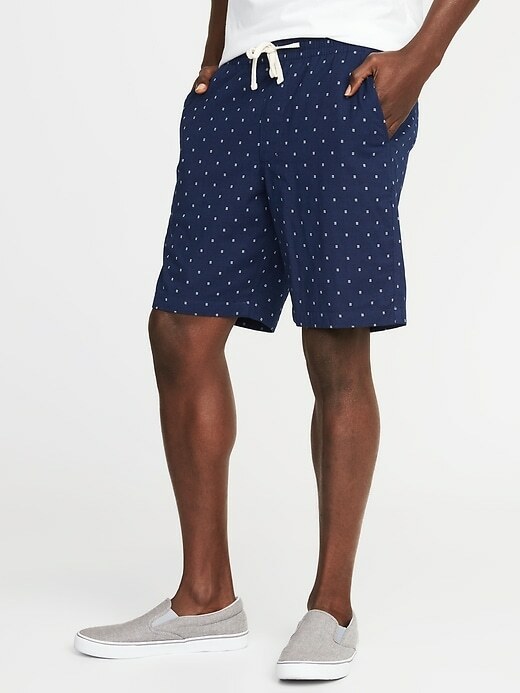 These nautical jogger shorts are sure to be on heavy rotation this summer. They feature an elasticized waistband for ultimate comfort between devouring hot dogs and hamburgers and playing a round of croquet. Soft, lightweight double-weave twill keeps him cool on even the hottest of summer days. The 4th of July is for good food with good people. 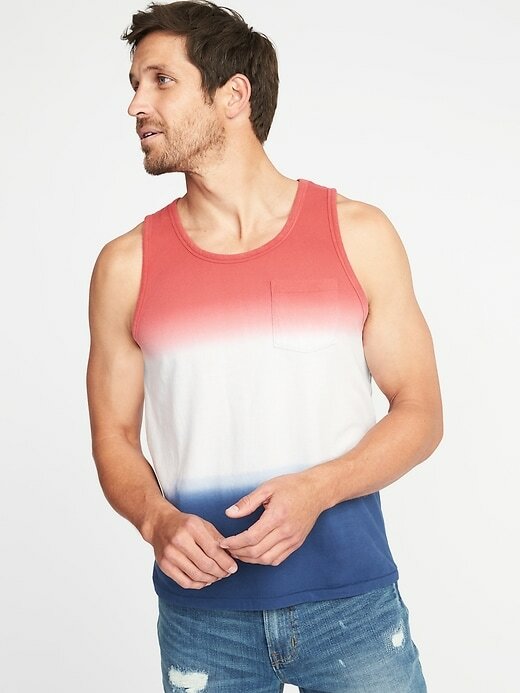 No matter if you’re at the hottest party of the summer or just chilling in the backyard, make sure your outfit is both comfy and classic to enjoy the 4th in true patriotic style. Between hot dogs, ice cream, and adult beverages, you’ll want to make sure you wear the right top to accommodate a day of eating. Consider a flowy top like this option, which provides both style and comfort from day to night. The navy stripe print makes this top perfect for the 4th and beyond. Distressed denim is a must for your 4th of July ensemble. These cut-off shorts feature a classic high-rise fit and medium light wash that make them universally flattering. Wear with your top tucked in or pulled out for instant Americana style. These hand-crafted, stainless steel sunglasses are equal parts cool and chic. Gold rivets surround the circumference of the lenses to add style and edge. Try them in black for a fail-safe option or pink if you’re feeling bold. This classic American flag baseball tee is guaranteed to become his most-worn shirt this summer. Perfect for 4th of July celebrations and other fun summer adventures, he is sure to love this tee for its lived-in feel. Personalize with your little slugger’s name to make it even more memorable.